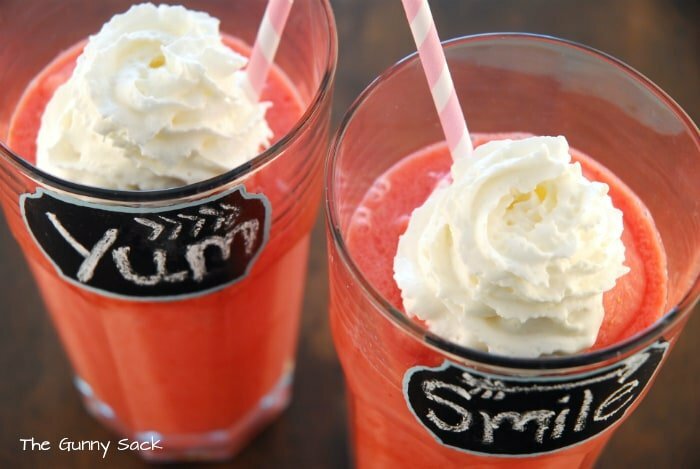 Strawberry smoothies are easy to make and my kids love them! 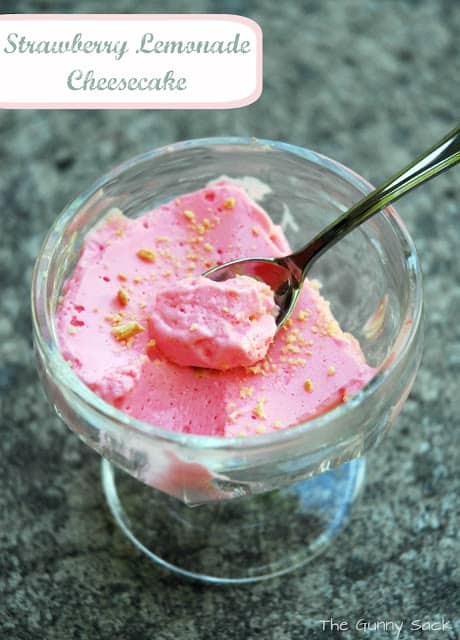 This recipe includes strawberries, yogurt, juice and ice. Just blend until smooth and it is ready to drink! Yesterday I told you about our fun weekend and our delicious breakfast. 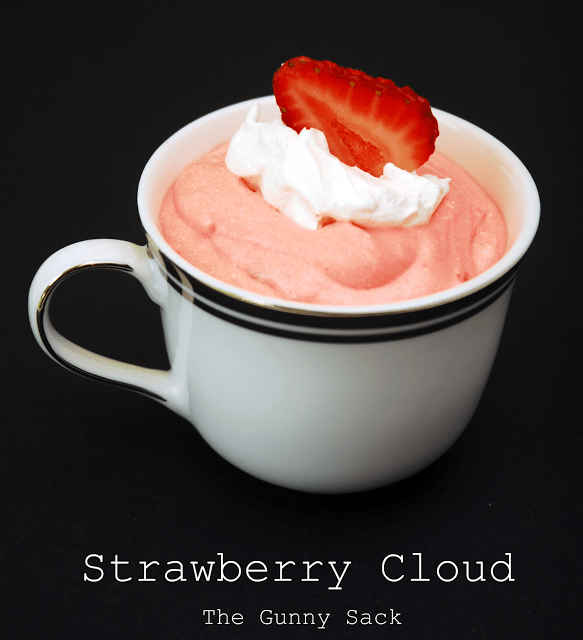 I promised to share my recipe for how to make a strawberry smoothie. My son doesn’t eat very much fruit but if I can blend the fruit into a smoothie or shake, he will drink it as long as it tastes good. So, smoothies are a great idea for him. My sister makes a smoothie that involves pudding and he loves that one. One of these days I am going to have to get her recipe. 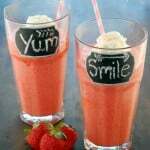 To make strawberry smoothies, I put the ice, strawberry juice, frozen yogurt and strawberries in the blender and blended it until smooth. I had to start with only part of the ingredients and then add the rest after blending for a bit, so that is how I wrote the recipe instructions. I’m not sure if that is because we’ve had this blender since our wedding or if everyone will have the same issue with their blender. Once blended, divide the smoothie between cups. The recipe can fill 2 jumbo sized cups, 4 medium sized cups or 6 small cups depending on how many people you are feeding. 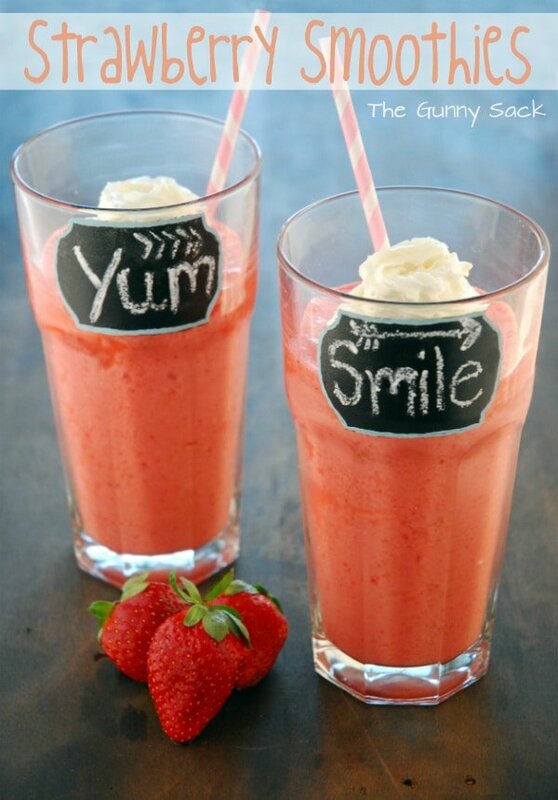 Top the strawberry smoothies with a little whipped cream, add a straw and enjoy! I thought these smoothies were a bit on the sour side but my kids love them that way. 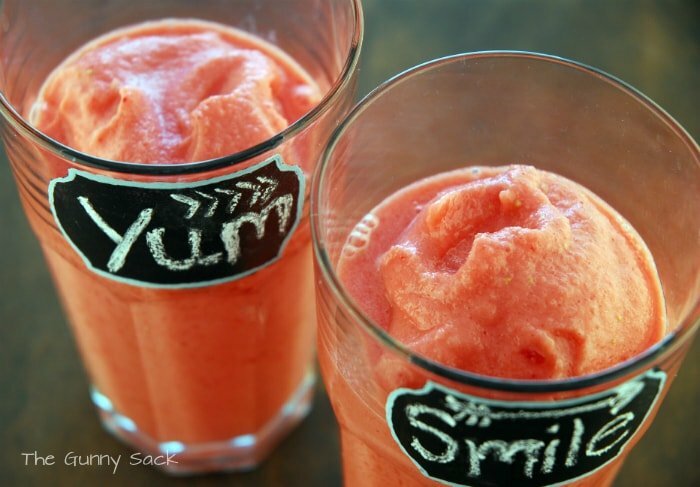 If you prefer your smoothies more sweet, add some sugar or more frozen yogurt. Christine really wanted to add some granola to her smoothie but then she remembered that she already finished off the rest of our granola. She will have to try that next time! Looks good Tonia. I do a similar for kids sometimes and add 2 cups spinach to it. With the greens it doesn’t look as pretty but tastes the same.. Great pictures on your site by the way. This looks so delicious and refreshing, thanks for sharing! Okay, you think you’re fancy now with your WordPress blog! LOL Very nice. I’m feeling a bit sad you’re just coming into strawberry season and ours is well and truly over. Oh well. 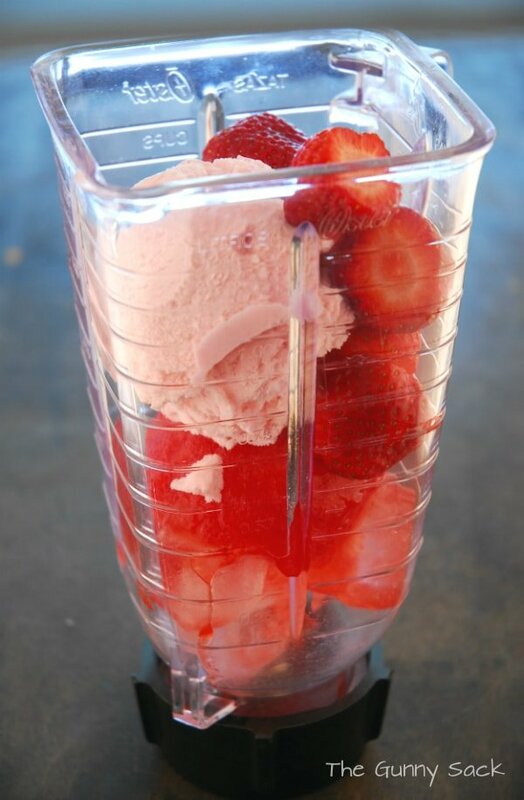 I might have to get some frozen strawberries to try this smoothie. I’m going through a bit of a smoothie phase. 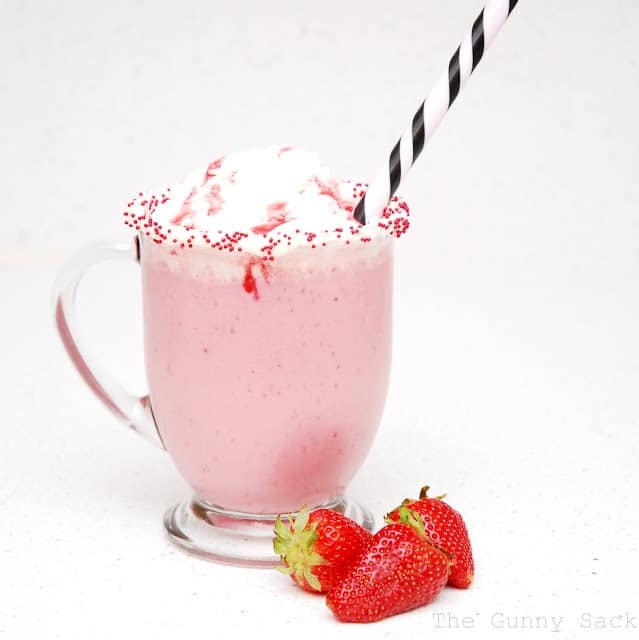 I’ve been kind of obsessed w/ strawberry shakes lately perhaps I should switch over to this yummy (and much healthier)option! Really makes me ready for summer.. Pinned for later because it looks so yummy. Thanks Jodi! I am really looking forward to summer too! Yummo! I got such a kick out of reading about your mini staycation, your children will remember that forever! Oh, not to mention they will want to do this again….and again…Ha! Pinning the smoothie to try this weekend. Thanks Jenna! The most certainly will want to keep doing it!